Where's the Joe Thomas LT Tribute? Hey, you give gronk a tribute card but when DRC retired, nothing. What is the deal. Is ea even caring about anything else but there own self interests. Working full days... Played half of the first set of House Rules last night and will play half tonight. Then grind it out until I get those wins in the second House Rules event. A worthy bribe to play squads. "Will you be trying to complete the house rules...?" You know, EA... I have a job, a familiy and I simply don't have the time sitting in front of a console for hours during the week. I would like to play solo challenges with similar rewards with no time limit, at weekend - friday night, saturday night, sunday morning. But hey, I'm fine with my 95 ovr Bell I got for playing 60 challenges (don't really needed him because of Ricky), my 95 Taylor for 16 full games(had his 96 powerup allready) and 2600 scouts for 20 challenges (great!). And I still have the three UL-challenges every sunday! Congrats to all the people who are able to finish the house rules - getting three ovr 97+ and 99 Gronk for winning 20 games. BTW: Reached level cap 80 two weeks ago - Thought I'm gonna wait with the full legend pack for more legends to come. But now I highly doubt I'm willing to spend 20 bucks for this. Don't do it. I did it and got Ray freakin Guy. Then the UL I got for the house rules was again Ray freakin Guy. I mean they could have at least given me Morten Andersen so I can finish his UL PU. Anyway I think they killed it with this one. I'm gonna be trying my damnedest to get it. Yes it's going to take time, and will probably be a little difficult, but I can appreciate the fact they're making us put some effort towards getting it, along with some other great cards too. Exactly, I dislike the Pat's, but he's a first ballot kinda guy. 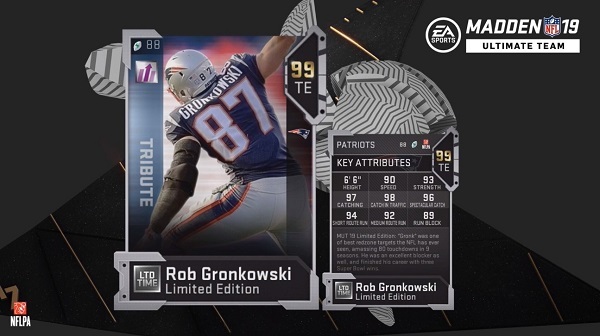 And they're giving us three 97+ cards for 20 games, a long with the free 99 Gronk. Seems beyond fair to me, especially when you remember, this is EA. They nailed it, this time. Glad someone sees a light. Why would you quicksell a GOLD 99 Gronk? Other than selling off your team? Make a way for solo grinders to earn this please.